So you're going to Copenhagen and you don't have a table at Noma. Who cares?! There is so much for the food-inclined tourist to do in Copenhagen that doesn't require hitting the refresh button on a website on the slim chance of getting a table at the former World's Best Restaurant (TM). 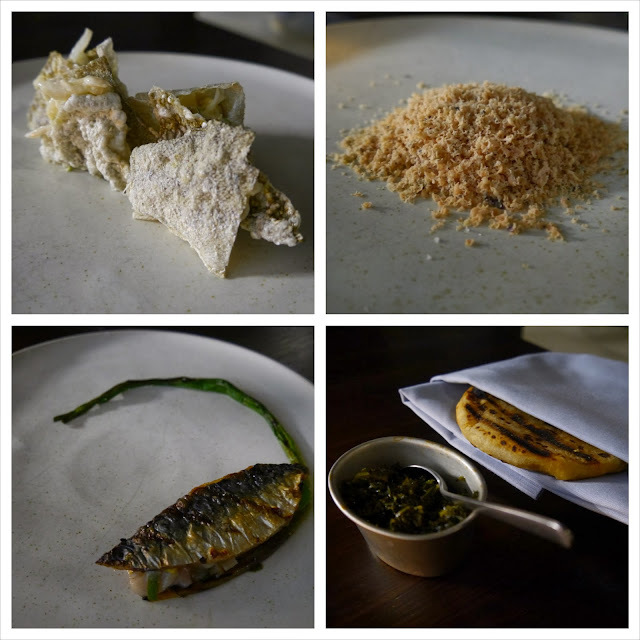 In recent years, a number of places have opened up clearly influenced by Noma and its "new Nordic" vibe, but have made the concept more accessible and affordable. Actually, on expense, it's a bit of a misconception that Copenhagen is eye-wateringly pricey. Well, it's true that if you wander too far onto the wine list of most places, your wallet will start to hurt, but it is possible to eat well and not remortgage. So in this post I've tried to highlight a mix of places at different price points. 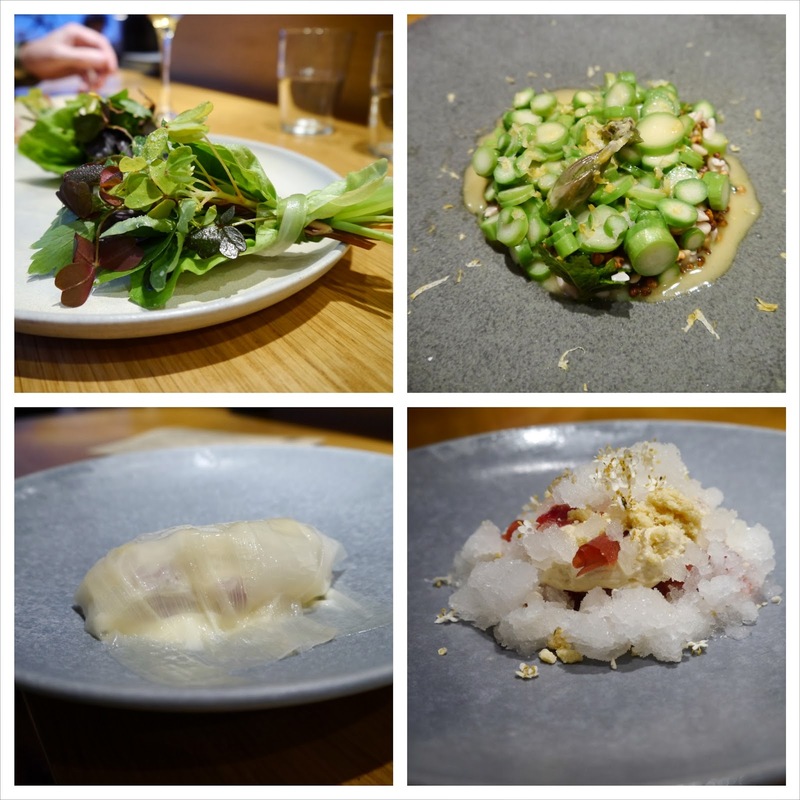 I've also only mentioned those that I've been to in the last 12 months including Geranium, Radio, Amass, Bror, Relae, Geist, Almanak and Manfred's (which means skipping good meals at AOC and Fiskebar). I've included spots for a quick bite like DOP and Hallernes too, while not forgetting tips on the best of the cakes and pastries. Oh, and I couldn't leave out Tivoli either. So here is my non-definitive guide to eating well in Copenhagen. 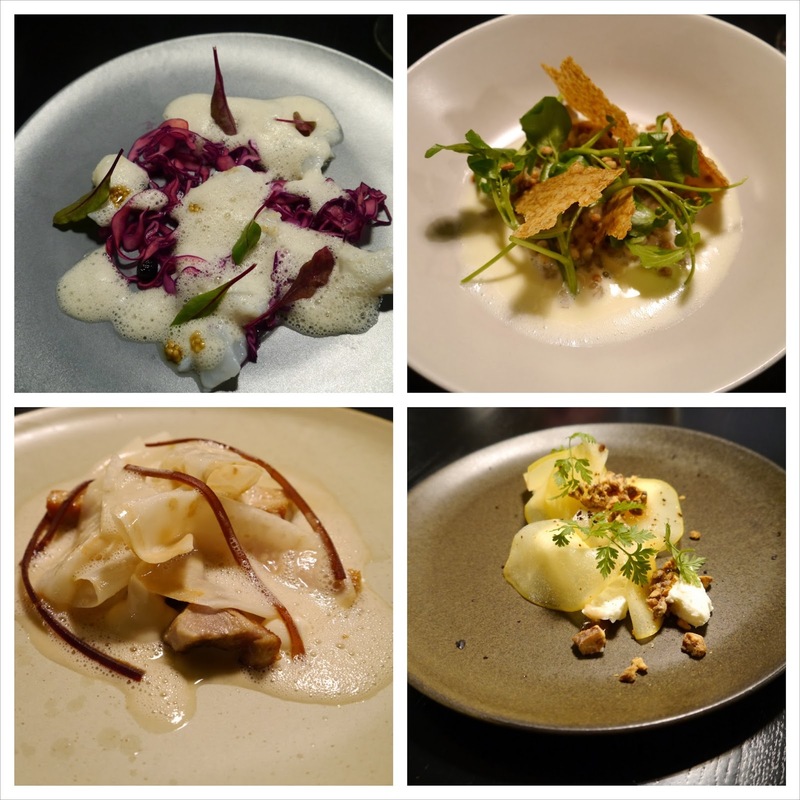 There are plenty of places in Copenhagen where you can easily drop £200 a head on dinner and Geranium is one of them. I ate here to celebrate a milestone birthday so was prepared for the cost, but equally, sometimes it's best not to think about it too much. Geranium is in a slightly odd location right next to the football field at Parken, but once you step out of the elevator into the foyer, it's a world away from the car park you arrive in. There's definitely a glamorous vibe, with huge, wide-spaced tables meaning you can have an intimate evening. The night we dined, a ferocious snow storm enveloped the city giving the experience a strange ethereal tone. The meal starts with a flurry of snacks before progressing to the "proper" courses which can be somewhat mind bending in construction. Dishes like the razor clams, pictured, add the right amount of whimsy without completely overwhelming you. 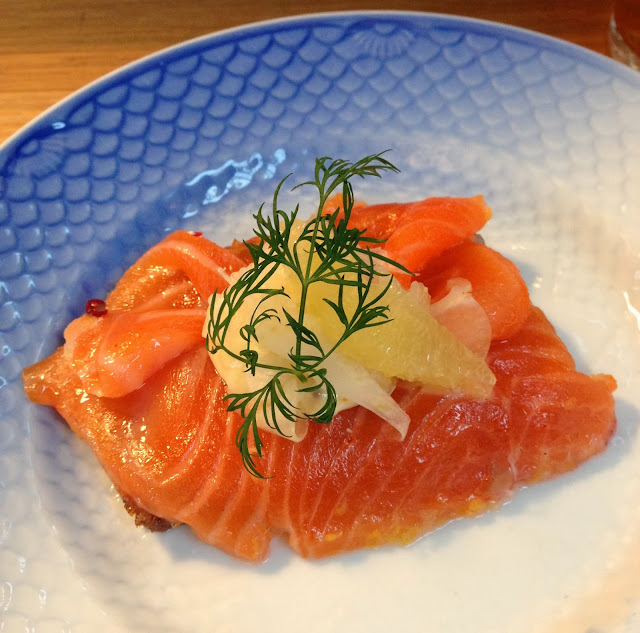 I loved the dill stones and salmon roe which was a playful nod to gravlax. More challenging courses, like raw lamb sausage paired with a yoghurt and horseradish sauce sit alongside others like crazy heather-smoked, moss-covered turbot. Towards the end of the meal you're invited into the almost sterile kitchen for a pre-dessert and an up close encounter with the gold, silver and bronze Bocuse trophy set, just to make sure you're in no doubt as to the skill of the chef. 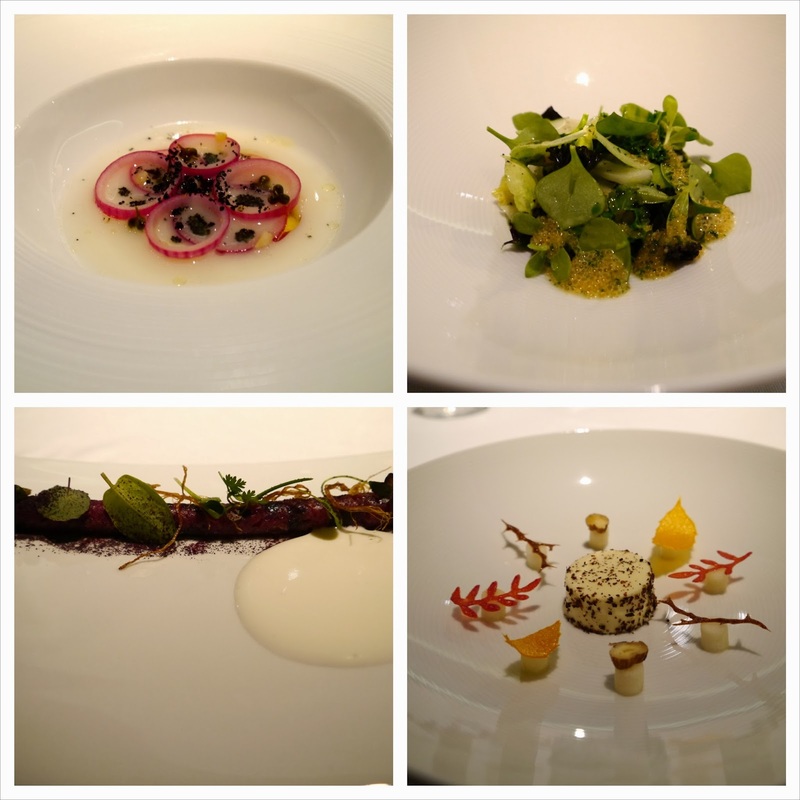 There's a reason that Geranium gained a second Michelin star this year. The food is exquisitely prepared with incredible attention to detail and served by a friendly and knowledgeable crew including the head chef Rasmus himself. A meal here starts at DKK1500 (about £180) without wine. The wine list is dauntingly enormous, but we were expertly guided through it at not-too-painful price points. 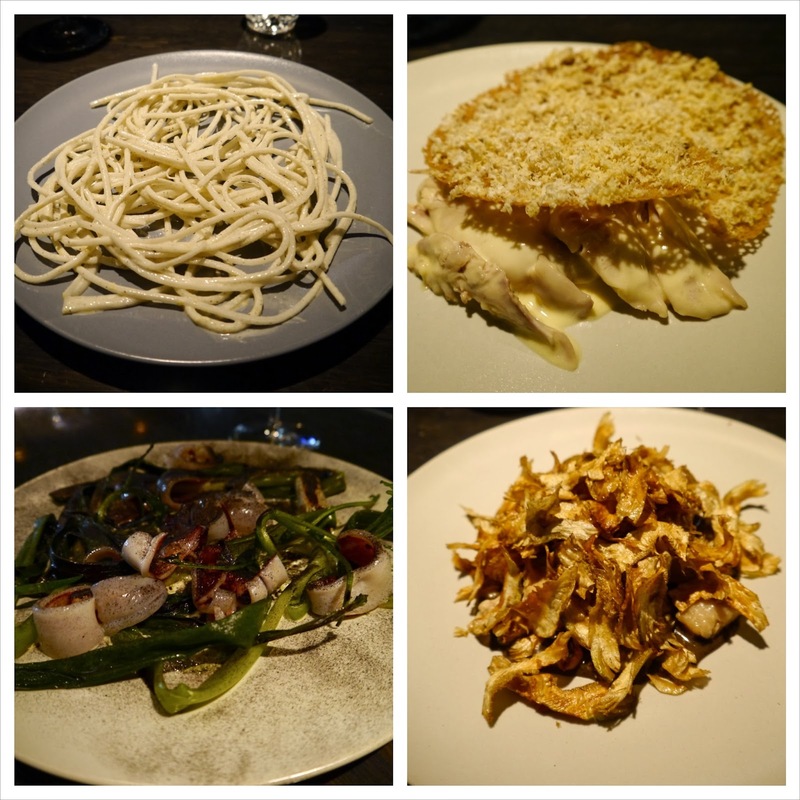 There are flashes of brilliance at Geranium, but the precision can sometimes feel slightly clinical. Still, it has to be one of the best night's out in Copenhagen if your wallet can stretch that far. Amass is a relatively new spot, opened in mid 2013 by head chef Matt Orlando who has a glittering career spanning Noma (most recently Chef de Cuisine), The Fat Duck, Le Manoir, Le Bernadin and Per Se. The huge space is housed in a fairly isolated location in an industrial part of Copenhagen best reached either by water or by taxi. At night, the bonfires are lit and cast a glow over the raised vegetable beds which supply the kitchen. There are a number of options to choose from with a set seven course meal, an extended 10 course or a limited a la carte menu. The wine list has a natural focus with glasses priced at a flat DKK95. 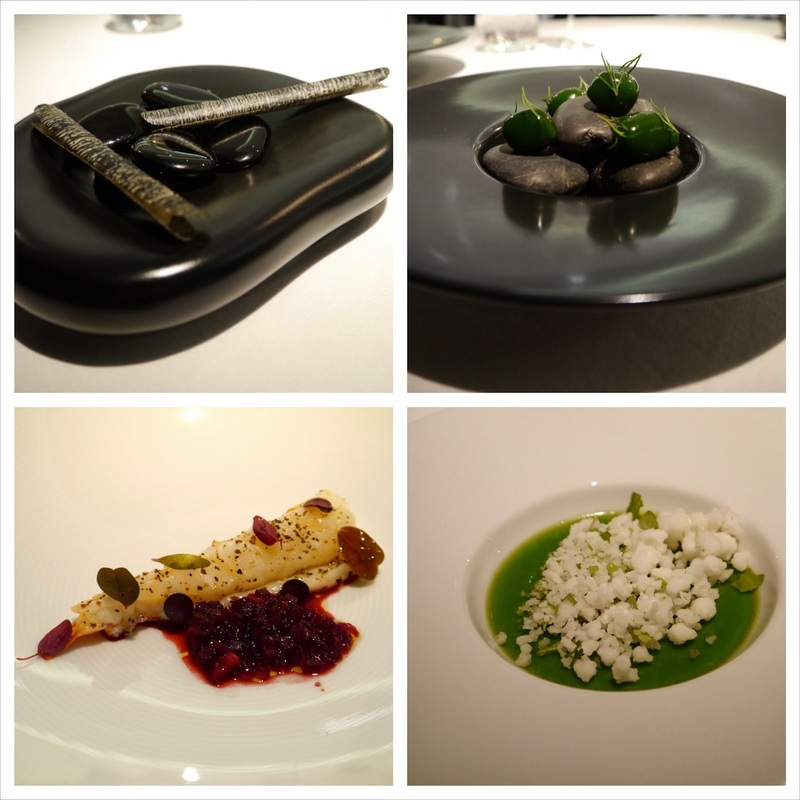 We went for the seven course menu at DKK575 and had a few glasses of wine along the way. The menu started with cod head rillettes which were squished between crispy cod skin, followed by salted mackerel with burnt onions. The smokey char from the young onions sat nicely against the gentle saltiness of the chopped fish which was topped with a crispy disk of mackerel skin. Another course of shaved frozen hot-smoked foie gras smothered raw shrimp with each mouthful melting on the tongue. The highlight of the night was Danish squid with a muscle sauce served with sweet crunchy green beans and some acidic sour plums. It's not just seafood though, the menu stepped up a notch with burnt kale and chicken. The chicken is actually 70 layers of chicken skin pressed together and cooked so that the outside is crispy while the centre remains richly fatty. This theme carried onto the fatty lamb breast which was paired with slivers of baby corn and corn silk cooked in brown butter. 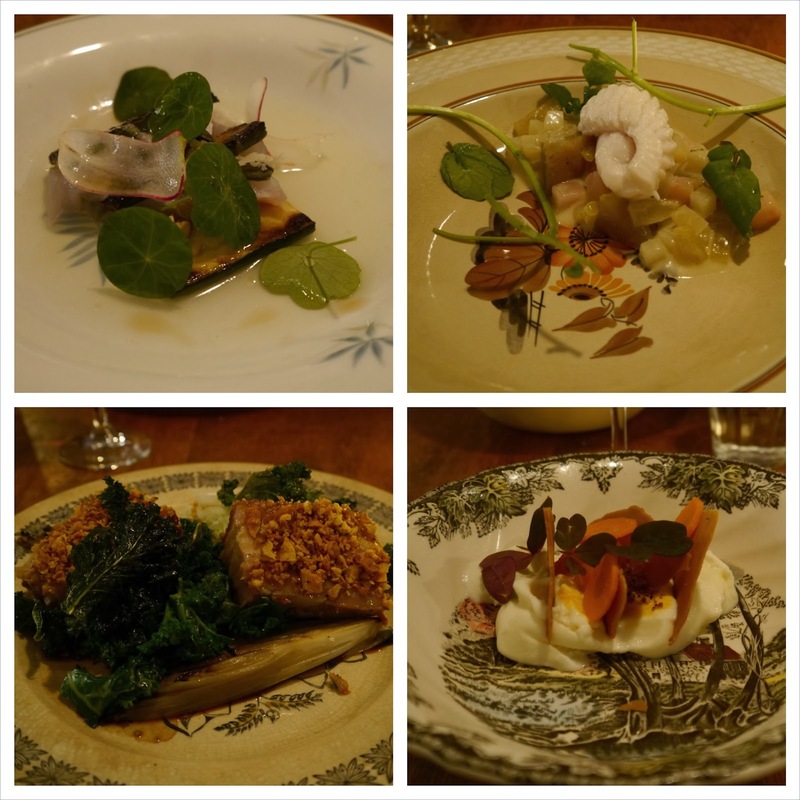 Amass definitely has a lot of buzz at the moment with tables hard to come by so be prepared to plan your meal. There is a nod to democracy with a number of seats held back for walk-ins however, so you could try your luck. There are also two tables for two right next to the kitchen which is where I sat. These give a bird's eye view of the action which I really enjoyed. I find the rhythm of a well oiled kitchen quite hypnotic. I enjoyed Amass and I think it's a place that will get better over time. I had a fantastic dinner at Radio. 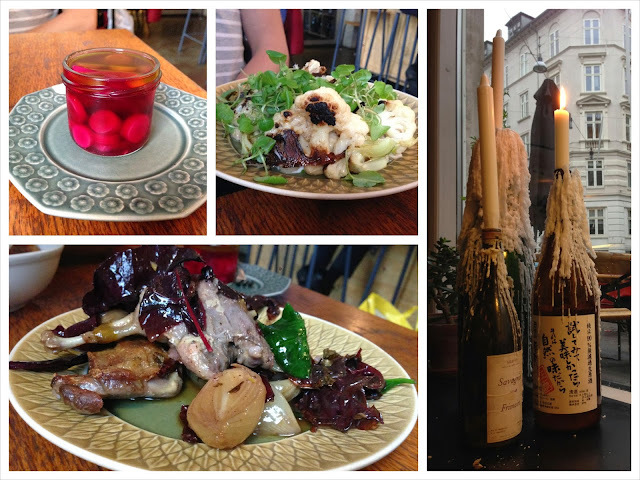 In fact, it was one of the best meals I've had in Copenhagen. Radio comes with a pedigree that spans some of the best kitchens in Copenhagen including Noma, Geranium and Geist so you know you're in good hands. The restaurant itself is very understated, being slightly cosy but warm and friendly with the cube-like kitchen space dominating a corner of the room. The chairs were also fantastically comfortable. We started the meal with roasted langoustines served with different textures of carrots, rye bread crumbs and a lightly smoked cheese. The bar was set incredibly high with this dish. I was amazed at how flavours were coaxed out of the carrots. We followed this with salt cod that melted on the tongue served with red cabbage and a mussel sauce. There was great balance to this dish with its tart and acidic notes tempering the gentle saltiness of the cod. There was a vegetarian course which was the essence of grilled cheese so it was obviously as fantastic as a warm hug - pearl barley, crunchy toasted wheat biscuit with peppery watercress and a thinnish cheesy sauce. The tender pork course was another revelation served with a celeriac purée and dehydrated apple. Such intense concentration of flavour in this dish made it hugely enjoyable. Dessert was also sensational. Pickled quinces with sugar roasted walnuts and small flecks of raw liquorice had amazingly fresh, acidic tones and was a great end to the meal. The five course set menu is a reasonable DKK400 and there are wines to match at DKK400, although we drank a very good Austrian red (St Laurent similar in style to a pinot) recommended by our waitress which was reasonably priced. You can expect innovative seasonal and exciting dishes at Radio. That, in addition to the wonderful free form bread baked in house is reason enough to return and often. 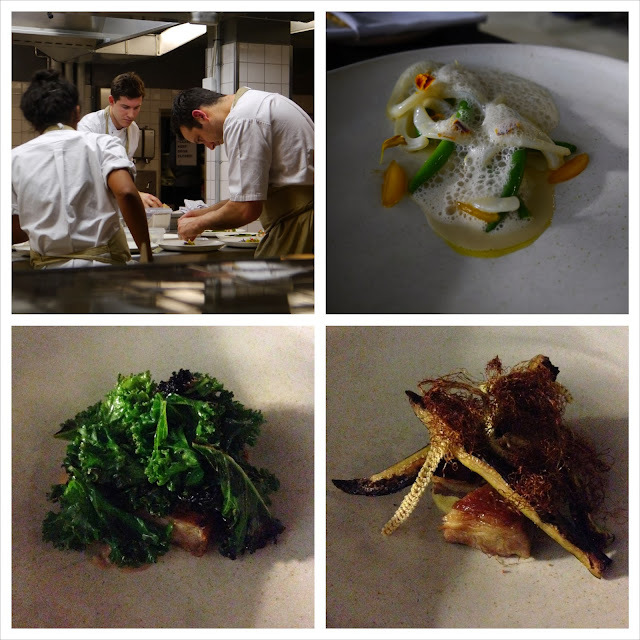 Relae is another kitchen with the Noma pedigree and has a Michelin star to its name. When I dined here, I sat at the bar looking into the small kitchen which turned out dishes that seemed to revel in pushing the boundaries in terms of ingredients. If I had to compare the style between Radio and Relae, I'd say that I found Radio a bit more accessible. We started the meal with a wonderful bouquet of 11 different herbs and flowers alongside a glass of champagne. We progressed through dishes like hake poached so gently the fish was meltingly tender but lifted by a salted bergamot, through to a stewed asparagus with puffed buckwheat and a mint purée before hitting an interesting chicken dish. The chicken wings were still rosy pink, despite being simmered for 2.5 hours, and were served with the heart and liver of the bird encased in thick shavings of white asparagus. Dessert was a refreshing rhubarb compote with an elderflower granita. It was topped with thin strips of curled dried rhubarb which looked a little like bresaola. Relae, like Manfred's across the street, is focused on natural wines, which I find a little hit and miss to be honest. Like most places you can match wine to the four course menu (both at DKK385) and we drank some, shall we say, interesting wines with our meal. 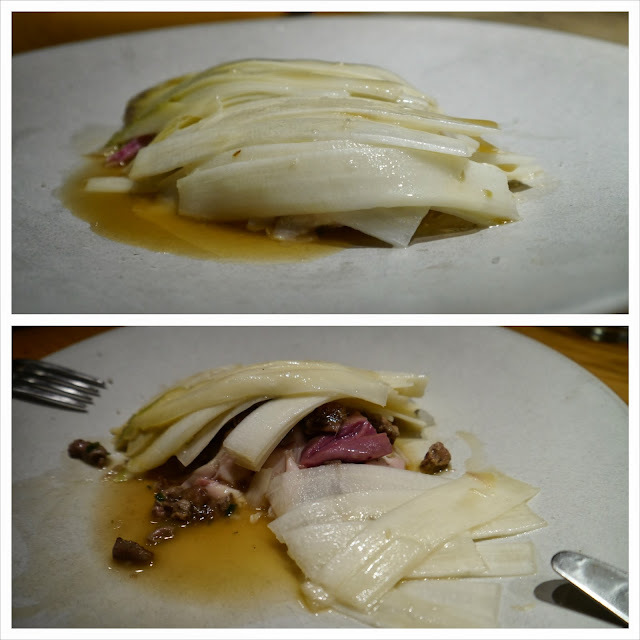 Still, it's good to experiment and expand your horizons.I really enjoyed my meal at Relae, and would go back in a heartbeat. Geist is a terrific venue, although at night it's one of the darkest places you could dine and it gets a bit raucous in there too. I guess it's all about atmosphere. For choice, I'd opt to sit in the area which surrounds the kitchen, but that's because I always like my dinner with a bit of a show. I still remember my first meal here a few years ago. I started with a slab of roasted celeriac with a buttermilk sauce and had my taste buds knocked awake. Such simple but intense flavours were enlightening. There is a great roast pork dish I've eaten on two occasions. It's served with deep fried artichoke leaves and a smear of black truffle paste. I enjoyed the creamy Oyster and Radish dish too, which is actually nothing like it sounds. Daikon is shredded into spaghetti-like strips and then coated with an oyster mayonnaise, with the oyster more of a scent than an overwhelming flavour. Terrific stuff. 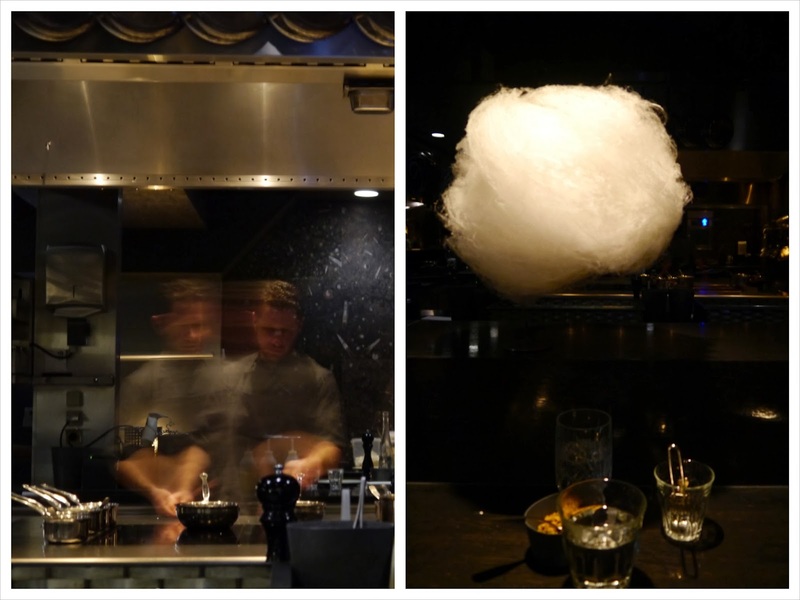 Always save room for coffee or tea because it comes with an afro-sized aromatic cotton candy. Geist comes highly recommended from me. 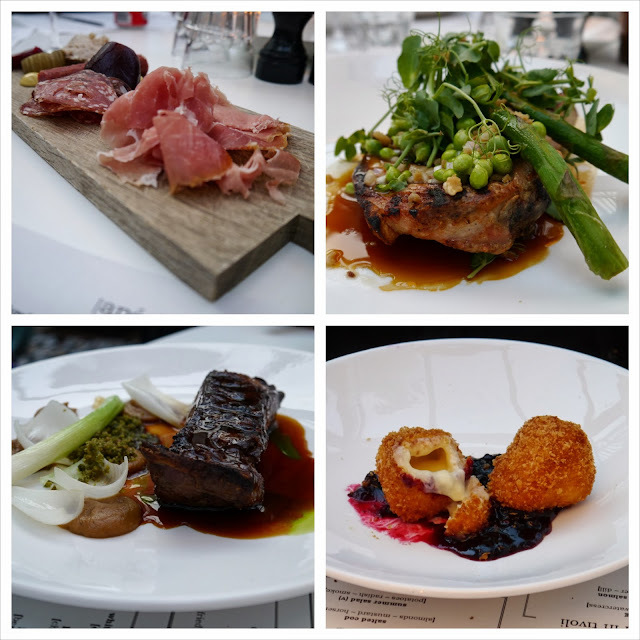 I wasn't bowled over by BROR, but I've included it here because I think it may have just been an off evening and because I've read lots of good reviews and seen many great photos on Instagram. 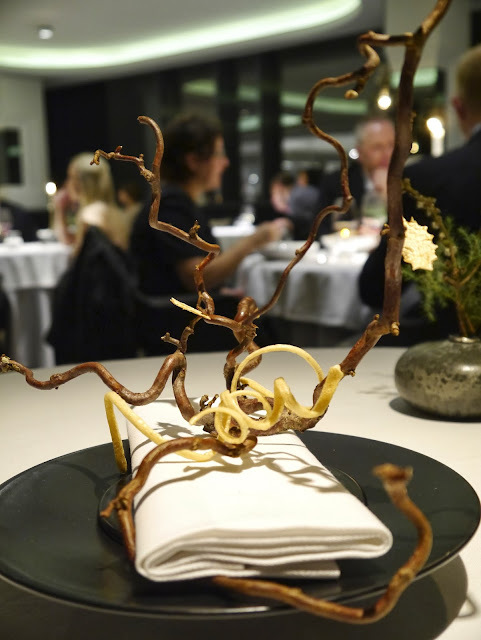 There is a set four course menu (DKK350), which can actually change during the course of the evening, but you can also start with a few snacks (around DKK40 each) or just stick to a few plates from the more limited a la carte menu. We started with a few small dishes which included bulls' balls. You know, testicles. They were gently poached, then sliced, battered and deep fried. Served with a chunky tartare sauce the smallish disks probably could have been anything. There was a slightly offalish giveaway from the texture though. The first couple of courses were pleasant enough. Skate with a pickled plum sauce, with kohlrabi, watercress and cauliflower had some great textures and I enjoyed the tartness of the sauce. I also liked the roasted pork belly with endive and kale, although it was quite a fatty serving and felt out of kilter with the more subtle dishes before it. On the night I visited, it was possible to pimp the set menu with optional courses. I chose the beef tartare which was roughly chopped and included blackberries. Again this was nice, but not really awe-inspiring. Overall, the dishes didn't leave much of an impression on me and I probably wouldn't head back with other choices like Radio. The Standard is a just-opened venue established by Claus Meyer, the man behind the man at noma. The building, right on the water around the corner from Nyhavn, is a stunning refurbished art deco construction, and the interior gives you a hint of the warmly muted Danish colour palette. There are three restaurants and a jazz lounge in the venue but I ate at Almank, which is an all day dining venue which focuses on the classic Danish smorrebrod at lunch, but here it's taken to the next level. I wrote a separate post on it because I was amazed at the flavours of such a simple concept. The dinner menu sounds impressive as well. Check out my thoughts here. If you are doing a long weekend in Copenhagen, it can be hard to find somewhere decent open for Sunday lunch. Manfred's fits the bill perfectly though and you can book too. Don't expect anything fancy - it's a small neighbourhood place. After a weekend eating, I couldn't face another seven course meal so we opted to choose a few dishes from the good value small a la carte menu. The dishes we had were simple but packed with in-your-face flavours. My confit duckling legs were perfectly cooked with lots of flavour partly thanks to the acidity of the added bergamot, but the plate was a bit on the oily side. A simple roast cauliflower dish and some pickles were fine additions to lunch though. You can't beat hot dogs in Copenhagen. They make a perfect light lunch and are cheap to boot too. By all means try out the carts that haunt most corners, but make a beeline for the Round Tower where the organic dogs from DOP will greet you. I think it's the interest added by the seeded bun that elevates it, but maybe it's the perfect construction and tasty meat used in the dog. Mine's always the ristet hot dog at about DKK35. This is a great pit stop when you're shopping or sightseeing and just need some fuel to keep going. 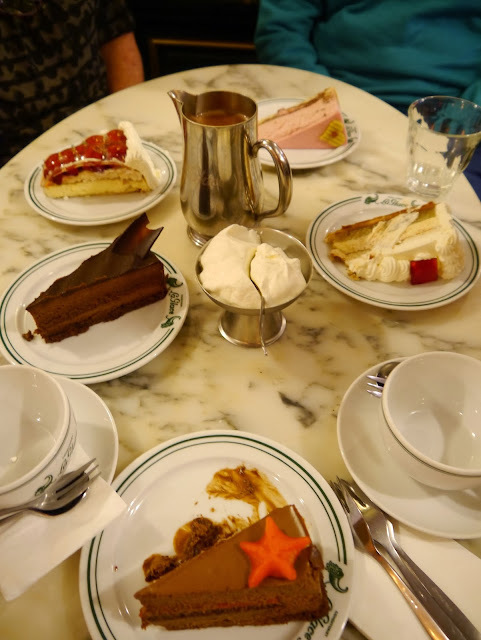 Conditori la Glace has to be one of the oldest cake shops in Copenhagen, founded back in 1870. The wood-panelled room with marble topped tables is a must visit despite the popularity which inevitably means a wait of some sort. My favourite cake is the one made specially for the Gay Games held in Copenhagen in 2009. The Stjernekraes has a light chocolate mousse atop a crushed chocolate base and has layers of hazelnut and almond praline with a surprise layer of tart apricot. It's rich but not cloyingly so. The best hot chocolate in town can be found here too, served in a tall silver pitcher with a side of fluffy whipped cream. It's perfect for a Danish winter...or any time of year really. This mouthful of a bakery, has spawned stores all over the country, but I think the quality is still great. A pastry or two and some coffee makes a great to start your day and is probably a lot better than what is on offer in your hotel. I always tend to bring home a loaf or two of bread if my suitcase space permits - the one with five seeds is delicious. I have to thank The Foodie Guide (aka On The Frog) for highlighting the Hindbaer snitte (an insanely good raspberry slice) at Meyers. There is a branch in the basement food hall of the department store Magasin du Nord where you can rest your weary feet and your credit card, while there is another on Jaegersborggade where you can fine Relae and Manfred's above. As the name suggest, this is another Claus Meyer concept - the man has a midas touch. 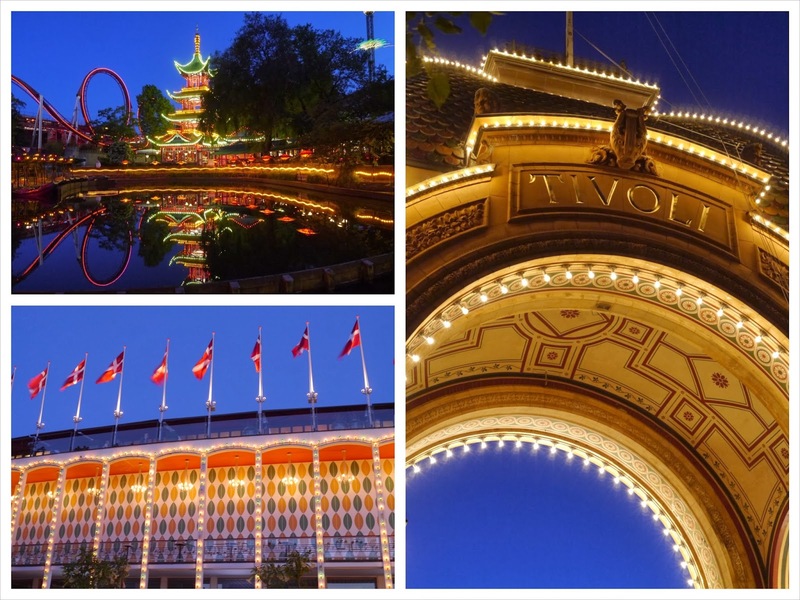 I couldn't mention Copenhagen and leave out Tivoli. If it's your first trip to Copenhagen, then it should be on your list of places to visit, even if you're not into the rides (although they're awesome). It's a great venue to wander around in, especially at Christmas when it is at its prettiest thanks to all the lights and special events that take place. Even at the height of summer, when there is still a faint light hanging in the sky when Tivoli closes at around midnight, the place is pretty special. Eating in Tivoli can be a hit and miss and expensive affair, but Madklubben Grill has been reliable on two occasions. It's not going to win any awards for creativity in the dishes, but what they do is done well. If my mum can vouch for the quality of the pork chop (best ever), then I think it's a safe bet. For Tivoli, the three course menu is an absolute bargain at around DKK200. It's a popular venue and it's a safe bet to book in advance if you're planning on eating even though it's a big venue. Just don't get on the roller coaster right after. If you want a light lunch, Torvehallerne is a great place to go. There's a huge variety of independent shops to eat at or pick up fresh ingredients. When I visited, on a cold snow-covered January day, bonfires were keeping people warm as they went about their shopping between the two halls. I ate a gorgeous smorrebrod (marinated salmon with remoulade and lemon) at Hallernes, which has been voted Copenhagen's best. 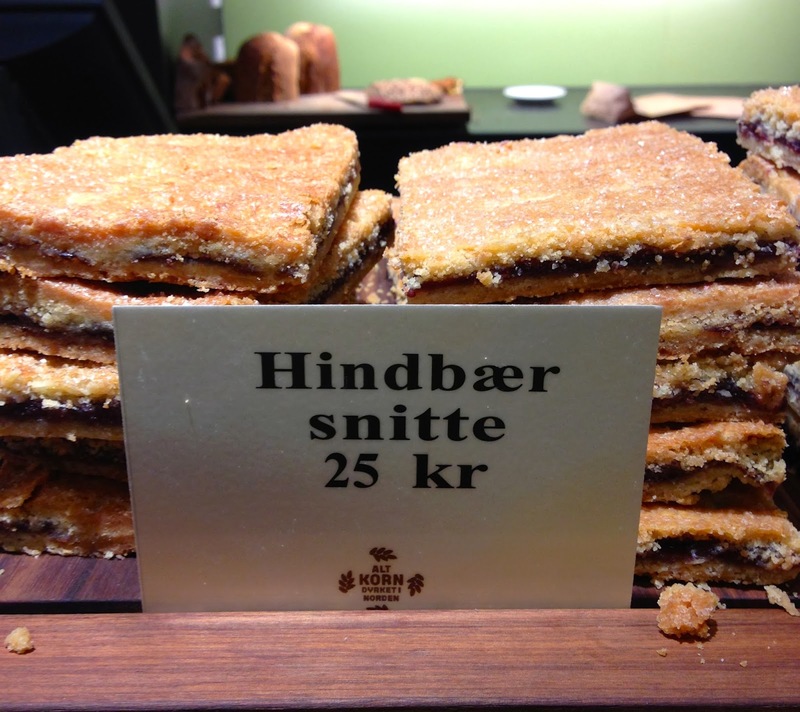 Torvehallerne also has a branch of the Coffee Collective and decent pastries from Lauras Bakery. Try the kanelsnegl, which is a light and flaky cinnamon and custard pastry. Great post! I'm looking to visit Copenhagen, but I'm not sure whether Nordic cuisine as a whole is too challenging for my palate. For me I prefer the overall taste of the dish rather than the 'challenging combinations'. If possible can you please give me your viewpoint, given that I haven't tried Nordic cuisine before? Thanks June. I would still recommend a visit to Copenhagen even if you are unsure about the food. Restaurants like Radio and Almanak above are not challenging at all. I tried another s few months back called uFormel which was also great (check my Instagram for pics!). There's all the great cakes and pastries to eat too. Plus the Danes are lovely and friendly so you're bound to enjoy yourself.